Shiloh joins world premier of this new musical. Shiloh joins the Dance Faculty at AMDA. 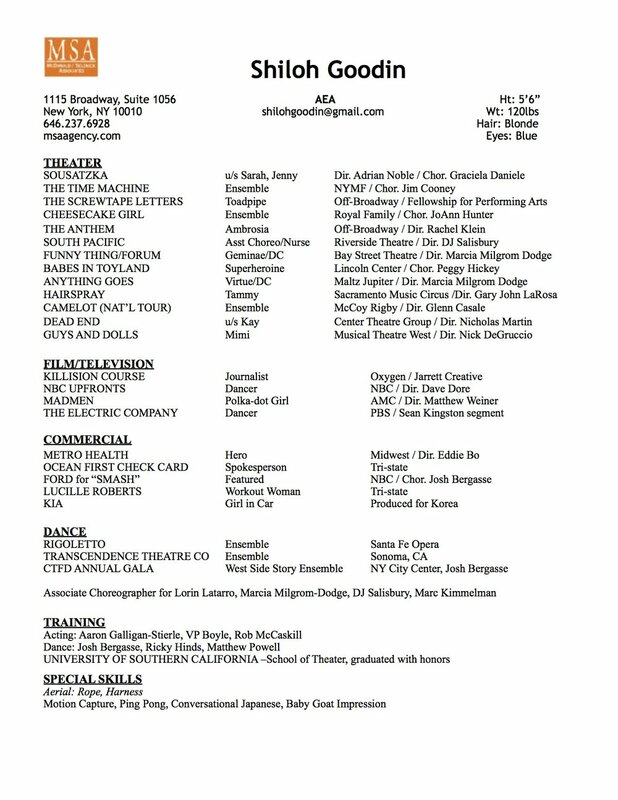 Shiloh joins as Assoc Choreographer on this Public Works production. Shiloh begins rehearsals for Chess as Asst Choreographer. Shiloh joins new musical TO WONG FOO as associate choreographer. Shiloh joins the cast of a new play presented at NYNWTF. Shiloh joins the creative team of THE NEW WORLD premiering at Bucks County Playhouse. Shiloh heads to Sonoma, CA to join Transcendence Theatre Company for their "Broadway under the Stars" series. Shiloh joins the cast of "The Time Machine", based on the H.G. Wells novel, featured at the New York Musical Festival (NYMF). Perfection! You rock even more than I thought.